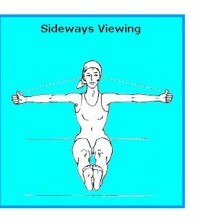 Lie flat on the back with knees bent and the heels touching the hips with the feet about one foot apart. Slowly lower yourself back to the ground and then in to the supine position. 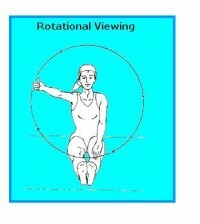 Initially practise chakrasana with the breath retained inside. Practice chakrasana once for as long as you can comfortably maintain it. On the back, abdomen or respiration. 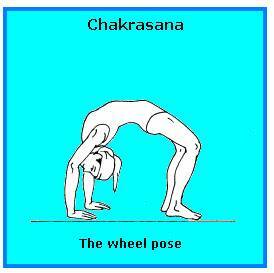 Always follow chakrasana with a forward bending counter pose. Chakrasana should not be practiced by sufferers of high blood pressure, coronary ailments, stomach ul­cers, toxic intestines, partial deafness or dilated eye capillaries, or by anyone who has recently fractured bones or undergone abdominal operation. After sufficient practice once you can perform this asana without even the slightest difficulty one can improve its effect by moving the hands and feet closer together in the final position. You may also try raising first one leg and then the other in the final pose.